You can use all of the app’s features for free with only two limitations: a watermark in the lower left corner and a 30-second limit for video exports. I’ve mentioned Snapthread in the past. I’m not on iOS anymore, but if I were, I’d use and buy Snapthread in an instant. Looks great. And the new icon is very fun. Over the past week I’ve written a bunch of posts while out and about using the iOS WordPress app, often with photos of things I was seeing. But unless I was on WiFi or had 5 bars of LTE connectivity, I would get a Posting Failed, Retry? message. The wild thing is even after hitting retry a bunch, it would still fail. And then if I flicked over to my draft posts folder, the post wasn’t there. If I didn’t keep retrying and instead clicked anywhere in the app, the post would disappear completely. Like Haughey, I too am frustrated with the WordPress mobile app (I’m on Android, and I have the same issues). I’ve actually removed WordPress from my phone because I can’t use it. It simply doesn’t work well at all. If I even try do post my photo posts with it crashes over and over and over and over. Which is why you’ve seen a lot less photos from me. 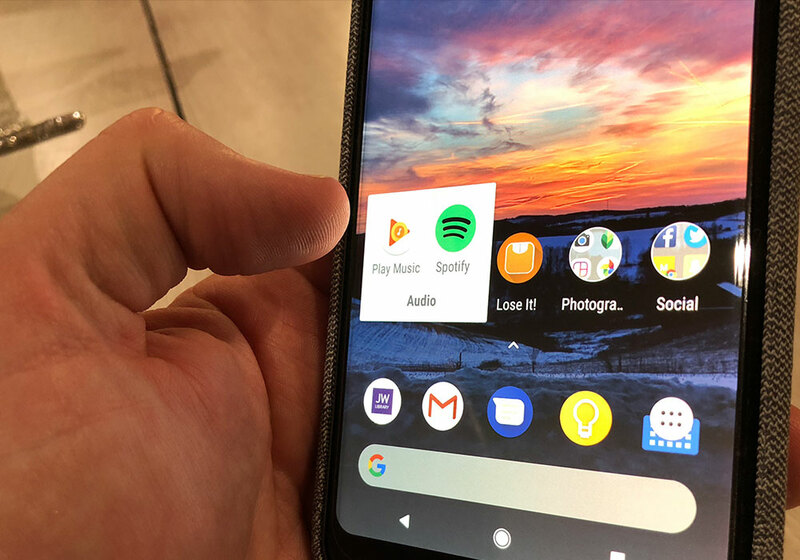 From the time I switched to Android in late-2017 (more here) I’ve been installing and uninstalling apps and services from my phone – trying to find the right mix for me. I expect the apps, preferences, and everything about my mobile experience to continue to change but lately it seems to have settled a little. So I thought I’d share what I’m currently using day-to-day. My current Android home screen. Pocket Casts – I have a 25-minute commute to and from work every day so having a podcast app that I like is very important to me. I’m so glad that Pocket Casts exists because Google’s default podcast app, called Google Play Music (for now) is not very good. Pocket Casts’ Up Next feature is very well done, in that I can create my own playlist using the currently downloaded episodes, or cherry picked episodes, from any podcast I want. I set aside a moment once or twice per week to curate that list and Pocket Casts does the rest. It also looks very nice in split-screen mode with the other app I use daily while driving Waze. Waze – I had heard about Waze for years before I tried it in earnest. When I first downloaded it on iOS and tried it I thought it looked like a game. (And, yes, I suppose it is.) But, it turns out to be very useful in many ways. Like Google Maps it can give you directions from A to B, but that isn’t really what Waze is made for. Waze is made to make your morning commute faster and safer. The Waze-using community can report problems like traffic, accidents, police, etc. and anyone behind them can be warned in advance of these things. It has made a huge difference in my morning commute and helped tremendously in longer trips like our trip to Kentucky earlier this year. Clip Stack – This little utility saves clipboard history and allows you to manage your clipboard. An app like this, on any platform, comes in handy more often than you’d think. JW Library – My Bible and research/study app for all things biblical. Not only does it have tons of different Bible translations it also allows for notes, highlighting, video/audio, and more. The app has continued to improve since it debuted a few years ago. Lose It! – I’m on a diet for the rest of my life so I use Lose It! to track my calories every single day. The app is updated often and is improving a lot each time. Snapseed – It takes a little while to get used to this photo editing app. But I love that I can save my own “Looks” (or sets of photo edits). I use it on my Pixel 2 XL and also on my iPad. Nearly every photo you’ve seen from me since December 2017 has gone through Snapseed. Flamingo – Unfortunately, if you don’t already have this app you can no longer get it. Flamingo is a sane Twitter app that records your place on the timeline and shows tweets reverse chronologically. Spotify – I love Spotify. After trying Apple Music for a few months I can say that Spotify’s playlists just absolutely blow Apple’s offering out of the water. There is no comparison. I can understand why iOS users would use Apple Music due to how it is built into everything – but there is no reason to use it otherwise. Spotify is just better. LaunchBoard – I use this app to quickly launch any app that isn’t on my home screen full time. You tap it, tap the first letter of the app you want, and launch the app. Think of it like using Spotlight on iOS. Same number of gestures too. WordPress – Short status updates and some of my photo posts are created, and sometimes drafted sometimes published, using the WordPress app. It was unusable on Dreamhost but now that my site is hosted on Digital Ocean the app works great. Something I didn’t realize was that I can use this app without activating the bulky JetPack plugin. So I’ve done that and my site is much happier as a result. In fact, I’ve reduced my site’s footprint dramatically recently and I couldn’t be happier. Chrome – One of the main reasons I switched to Android was being able to have a desktop and mobile browser of my choice. So I’m able to use Chrome (or any other browser) as my default. I also use Micro.blog via Chrome since that is the only way I can currently. Messages – Pixel’s default SMS manager is called Messages. It works fine for what I use it for. I’m not looking forward to the updates coming to “Chat” that I’m reading about. These updates feel like HTML email – they are fun, but I don’t need those things. SMS works just fine for me. I wouldn’t mind, however, end-to-end encryption of all messages. Voice Recorder – I record my audio bits using Voice Recorder. I haven’t be publishing many lately but I’ve been recording them still. This is a great way to capture content and ideas. Wikipedia – I read a lot of information on Wikipedia. Mostly on my iPad. Having an app dedicated to it is very nice to save pages for reading later, doing research on multiple topics, etc. Inoreader – I generally do not read RSS subscriptions on my phone unless I’m killing time. But, when I do I like having Inoreader on my phone. Feedly would work fine too. Notable mentions are Microsoft Teams and Slack, Google Pay, Twitter app (for Moments when something happens), Dark Sky (though, I’ve been using this less lately since Google updates me on the weather), Google Photo Scanner, Trello. Also, an app I use daily but that I didn’t have to install is the Camera. The Camera app is actually quite good for my use. Any Android apps that I should check out that are not on my list? After 10 years of using iOS as my primary mobile platform I’ve decided to give Android more than just a casual try. This post is my review both of the Google Pixel 2 XL and Android 8.1 as well as a few comparisons I’ve drawn between iOS and Android ecosystems. I’ve been an Apple fan for decades. But I’ve tried to be as unbiased as possible and truly allow my feelings of day-to-day use dictate my review. I’ve owned the Pixel 2 XL for over a month so I’m hoping that my first reactions have subsided. I’d been thinking about trying out an Android-powered phone for a few months but I think what pushed me over the edge was how many YouTubers rated the Pixel 2 so highly. Many tech reviewers have the privilege of getting their hands on dozens of phones. Which phone comes out on top (or very close) of most of their lists? The Pixel 2 XL. I switched to the Pixel 2 XL from an iPhone 7 Plus. The iPhone 7 Plus was a great phone — easily my favorite camera system in an iPhone — but not as comfortable in the hand as the iPhone SE. For a sense of how much I liked the iPhone SE you can read what I wrote here. By going from an iPhone 7 Plus to a Pixel 2 XL I upgraded the camera system in a number of ways. Front-facing portrait mode is far more important and useful in daily use than I could have imagined. I think Apple has missed an opportunity on the front-facing camera for years. It is likely used more often by younger people and yet the hardware and software driving the forward-facing camera is always superior on iPhones. With the Pixel 2 XL both cameras are fantastic and both offer the same software features. Photo: A rather terrible photo of the Pixel 2 XL’s ambient display. Notice the icons. 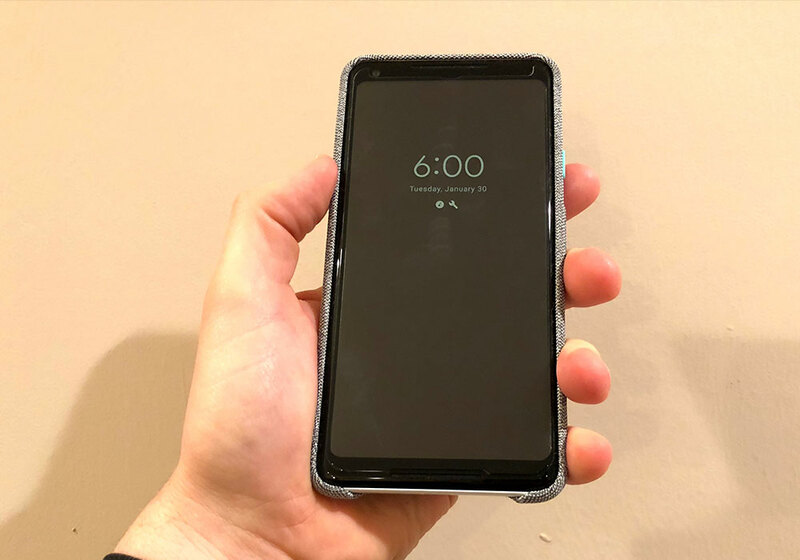 The Pixel 2 XL has a few features that are not available on next-generation iPhones, namely; a lightning fast fingerprint sensor, squeezable sides, screen that wakes with a gentle double-tap, an ambient display with clock and gentle notifications, and “what’s playing” feature (showing you what music is currently playing) that is always on. My phone is my primary camera. On hikes, walking downtown between meetings, or traveling – I like to be quick so I don’t miss any moments. With the iPhone 7 Plus I was like Bruce Lee with nunchucks. If I spotted a fleet-footed while on a hike I could likely capture it. After a few weeks with the Pixel 2 XL I’m beginning to feel my muscles learning the new gestures and maneuvers to get my groove back. One feature that makes this even better than iPhone 7 Plus is being able to double-tap the power button to invoke the camera app of my choice on the phone. The Google Assistant is a primary feature of this phone. I’ve always wanted to try a different assistant than Siri but Apple simply does not allow you to do so on iOS. You can download the Google Assistant app but it is a neutered experience. iOS does not give third-party apps the control they need to be useful and there is no way to invoke the assistant easily. On the Pixel 2 XL I have several ways to invoke the Google Assistant. I can squeeze the sides and nearly instantly I can begin making my request. I can say “OK Google” at any time and, again instantly make my request. And I do mean instant, unlike Siri, there is no pause needed between “OK Google” and my request. With Siri I need to wait for the “ding” sound. And lastly, I can long-press the home button to invoke the assistant. The Google Assistant’s results are much better than Siri. It gets my query correct the majority of the time. I don’t know what my success rate with Siri is but I would say it is less than 50%. I got so fed up with Siri that I only used it to ask for the weather each morning. With the Pixel 2 XL I’m using the Google Assistant multiple times per day. And, I use it for things that aren’t even possible on iOS like turning down my screen brightness, turning on or off my flashlight, taking a picture, etc. I charge the Pixel 2 XL at night while I sleep and I routinely plug it in with greater than 50% battery life. I have changed no settings on the phone to extend the battery life. In fact, I’ve turned on the ambient display and “what’s playing” features which warn you that it will use more power. In my use, even with the “always on” features turned on, I have no issue at all with battery life. I also appreciate that it charges with USB-C. I can plug it directly into my MacBook Pro, no dongle. To sum up, the Pixel 2 XL hardware is as good as the iPhone 7 Plus (and likely the 8) and has a better front-facing camera system, more options, and the squeeze feature. I bought the Pixel 2 XL within days of Android 8.1 shipping. Coming from 10 years of iOS, and the very limited number of user preferences it affords, using Android has been really fun. If I was a new user I could leave all the defaults as they are and be happy. However, I’ve enjoyed the number of options Android has. One of the complaints about Apple I’ve heard the most is that they make too many choices for the user. My rebuttal to that has always been “Yes, but they make good choices”. However, two things have changed in recent years. First, Apple is making worse choices. I know this is subjective but more and more I’m convinced that Apple’s choices are becoming more anti-competitive than they are user-focused. I can understand limiting some of the user preferences in iOS for the first few years to allow the platform to become rock solid, then slowly add more features and settings. But iOS is over 10 years old and there are a few options that Apple has, in my opinion, criminally omitted from iOS like being able to set default browser, email client, maps app, and assistant. Second, the resources of these mobile devices are beginning to compete with the speed and storage of slim laptops. The devices beg to be used heavily, for work, and for play. I would say for many people their primary “computer” is their phone. So we are entering an era where it becomes a work horse for people. Steve Jobs thought we’d always have pickup trucks (desktops or laptops) while also owning cars (mobile devices). Well, I believe these mobile devices are beginning to become very pickup truck-like for many. And, let’s face it, a huge number of pick-up truck owners don’t even need them. They just like the look. This mean that the mobile OSes must also become work horses. And that means more options, better compatibility, and power user features. This is a very long winded way of saying that I wanted to take back more control of my OS and Android allows me to do that. I can tweak Android in far more ways than I expected – even down to choosing a different launcher. Microsoft has one, there is another popular one called Lawnchair (cute name), and dozens of others. These change the device in both subtle and dramatic ways to become whatever the user needs. It makes so much sense. Imagine a launcher built specifically for young students? To sum up, Android gives users far more control over their devices than iOS. Photo: Notice how app folders appear directly below your tap, not in the center of the screen. Powerful notifications – On the ambient display there is a subtle icon letting me know there is a notification for an app. In the status bar that icon is on the left-hand side. Pulling down gives me actionable, and “snoozable” items to deal with. You really need to play with it to understand. iOS’s notifications are clay tablets in comparison. Do not disturb – I’ve found Android’s do not disturb preferences to be far more sane than iOS. Apps do not continue to beg me to turn on notifications. DND turns on when I go to bed, and turns off when I wake up. It turns on while I’m driving (something Android has had long before iOS). It can also be turned on by turning my volume down one click more than just “off”. It is a brilliant feature that is useful for theaters. Also, DND watches your calendar, if you’re “Busy” it turns on DND. At first I thought this would be overbearing, but in fact, it is incredibly thoughtful and sane. An always available back button – iOS 7 brought a “back” button to the top left of the OS. But this is a terrible place for it. Android has an always available back button on the bottom left (bottom right on Samsung I think). It doesn’t just bring you back to the previous app but back in every context. It remembers exactly where you were last and takes you there. When I pick up my iPad I’m always reaching for this back button now. App size – Android apps, and certainly updates, appear to be tiny when compared to their behemoth iOS siblings. Some daily use apps are less than 5Mb on Android. I’d love to take the time to do a true 1-to-1 comparison. My gut says the differences are substantial. Device compatibility – I can plug my phone into my MacBook or Windows 10 PC and see the files on it. It almost seems absurd that Apple never created a similar sandbox approach like this to be able to store files or access files created on the device. This comes in very handy. 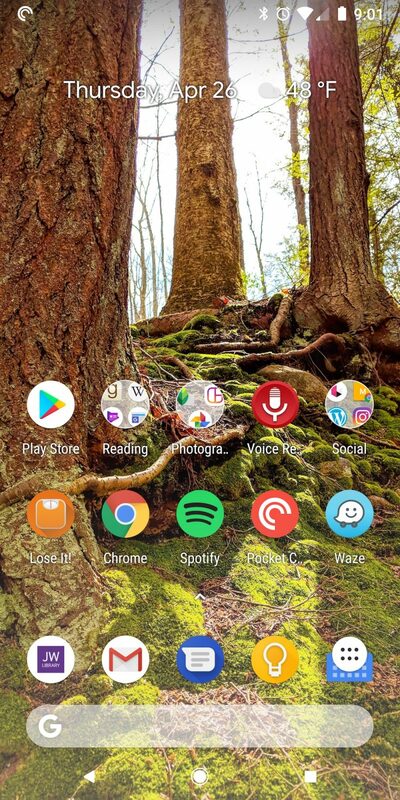 Home screen reachability – icons on your home screen can be placed anywhere you prefer. Naturally they are on the bottom of the screen because that is where your thumb rests. A feature that I’d bet will be in iOS 13 but that Apple stubbornly hasn’t brought to iOS yet. Widgets – widgets aren’t for everyone. Some of them are poorly designed. But there are a few that are unobtrusive and simply make sense. In the screenshot of my home screen above you can see two in use – one for calendar and one for weather. But many apps ship with widgets that you can place on any home screen panel. I’ve seen others that have note taking apps on their own panel. They just swipe and start typing. It is pretty nice. New app icons – When a new app is installed you can choose to have the icon be placed on your home screen or not. I’ve chosen for all apps to go into the app drawer and keep my home screen tidy. I love this option. Folders open under your tap – This is a subtle thing. When I tap on a folder on my home screen it expands directly in place where the tap happened. It doesn’t open in the center of the screen. And, the app folder is only as big as it needs to be depending on the number of apps in it. Split-screen apps – I’ve used this more than I thought I would. I’ve used it for note taking in certain circumstances but also for phone conferences. I can have my email open and my phone app open to type in the 8 digit pin that I received. There are a few things that iOS clearly beats Android on and I’d be remiss if I didn’t point them out. Here are a few that I’ve found that I notice in day-to-day use. Smooth scrolling – iOS really does scroll like butter. I don’t know what Apple does that Android engineers can’t (or don’t, or won’t) but the scrolling on Android isn’t nearly as buttery smooth as iOS. The gap has closed considerably in recent updates but there is still a long way to go. Cursor movement and text selection – I wouldn’t say that iOS great at this, but it is better than Android for me so far. I also feel like this might be a muscle memory issue. I’d like to see Google bring some of iOS’s keyboard dragging features to Android. I’m getting better every day though. Scroll to top – On any list in iOS (say, your contacts list) you can scroll to the top with a single tap on the status bar. Unless I’m missing something, and I’ve asked a few Android users, this simply doesn’t exist on Android. So if you scroll way, way down on your contacts list and you want to get back to the top you have to flick a million times like an animal. Please, if I’m missing something write in. Safari’s Reading List feature – Even with Unmark (which I use daily) I still used Safari’s Reading List every day. Google has, inexplicably, added a “reading list” to Chrome for iOS but on no other platforms. Perhaps they did this to compete with Safari on mobile platforms but why not have it sync with desktop Chrome? Anyway, Google can quickly get on this please because I neeeeeed it. Dictionary lookup – On iOS you can long press any word and get its definition. Because my vocabulary is as deep as a kiddy pool I use this feature a lot. I’ve installed a third-party app that does this on Android but it should be built-in. So far I’m very happy with my choice to give Android a try. I’ll be using the Pixel 2 XL and Android for the rest of 2018 and plan to reassess where both platforms are at that point. I’m always shocked when I’m out and about with someone who has their phone set up to notify them of any activity—a mention on Twitter, a comment on Instagram, or worst of all, an email. The thought of receiving a notification upon receipt of an email gives me the shivers. I thought this might be a good time to bring this topic of notifications back up. Not only because Jeremy wrote about it but also because I now own an Apple Watch – which may seem counter intuitive to this whole distraction free discussion. However, I’ve found the Apple Watch to be a lovely little device that can easily be set up to unobtrusively notify you of important things. In fact, I believe it is less obtrusive than an mobile phone. I am not notified of any social network activity or emails. Those things I dive into when I feel like it. With this set up I feel I’m very rarely distracted by a notification. And now with the Watch, I can say I’m less distracted during a conversation with the persons in front of me physically. Here is a scenario: you’re have a chat with someone and you get a text message alert. Your phone either makes an audible noise or it vibrates and the screen illuminates. The other person saw and/or heard the alert. So now they know your brain is wondering what that alert could be. Even if you don’t break eye contact with that other person, they know and you know you have a message waiting. With the Apple Watch I get a gentle tap on the wrist when I’ve gotten a text message. The screen does not illuminate. The other person doesn’t know I’ve gotten an alert. I’m able to stay present and check the alert when there is a break in the conversation. In this way, I think the Apple Watch is less obtrusive than a phone. I could not love this more. Can we get all of the news sites to do this? I can’t tell if this is official or not. Either way, bookmarked. The Lehigh Valley Tech Meetup is an excellent community in the Lehigh Valley that meets monthly at the Ben Franklin Technology Partners incubator within the Lehigh University Mountaintop campus. The community around the meetup is excellent and the building is amazing*. While the tail-end of my presentation walked through my experience building my first iOS app Summit, the majority of my presentation was focused on helping early stage companies think about their go to market strategies. I’m currently advising several companies, a few of which are businesses built around mobile apps, and have heard about 11 other start-up pitches this year so far. And during that time I’ve noticed a trend. Entrepreneurs that are attempting to build a business around an app sometimes underestimate the amount of thought that should go into the marketing and sales strategy for the app. It is as if some feel that apps are less thought and work than products that you can touch. So during my presentation at LVTech I hoped to convey that the same “boring” (yet, tried and true) business practices that apply to products also apply to software. Does your idea service a large enough segment of the market? We hear the “scratch your own itch” mantra a lot. However, it won’t always lead to finding hundreds, thousands, or tens of thousands of customers. How will you reach those customers? Are there ways to expand your idea into other products or services that can be sold to the same segment? How will you sell or package your idea? By considering these, and may other questions, you can determine if your idea has enough layers to support an entire business or if you just have an app idea**. Press-based launch strategies: some thing that by being covered by press will be enough to get them to profitability. They have no other strategy. On the contrary, getting press coverage early on will give you very muddy analytics which will make decision marking very difficult. Very seldom are the tech audience your real customers. How long until profitablilty: More and more entrepreneurs begin with the plan of losing money for 3 or more years. I believe this stems from press coverage of other companies getting large rounds of funding. Most businesses should strive for profitability within the first quarter or year of business. ”I’m not technical, I need a technical co-founder”: Don’t be this person. Anyone can learn to code. Geeks are not smarter than you. They’re just interested and relentless. Be the same. We then did about 10 minutes or so of questions and answers. The questions I got were really great and I appreciate all those in attendance helping me with the answers to the questions I didn’t have much experience in. Thanks to Tim Lytle for the invitation to speak and to Ben Franklin Technology Partners for the continued support. * I worked in this same building for years while at Viddler. But when I worked there the back half of the building didn’t exist. In fact, Viddler started in Jordan Hall – the building just beside the new building. And now, they are extending it even further. The building is an amazing place to work and have a meetup of this kind. I’m jealous that our incubator in Scranton feels so dated when compared to this building. Especially comparing the meeting spaces. ** It it totally fine to “just have an app idea”. I do. And I’m loving working on it. But it is also good to have the proper perspective about your app idea. I want the web to be faster. Breaking links should not be part of the solution. AMP is terrible. As is any solution that changes the URL. When wap. * or m.* was “a thing” I hated that too. Now, more than ever, there is less reasons to change the URL to load a web page tailored specifically to the viewport, device, connection. It is possible to do it without changing the URL. Dave Morin, CEO of Path, recently did a small AMA on Product Hunt. He pointed out this article on Wired about Path breaking apart its mobile apps into other applications. Something I wrote about recently as well. Here is some interesting bits from the article. It is hard to argue with this thinking. Just about every week “the masses” switch from one app to the next. Not just in social networking but also camera apps, messaging, etc. So if Path is repeatedly a source of new apps, rather than simply a single app, then perhaps they can be a choice. But Morin also says that in becoming a “multi-app company,” Path can also take take better advantage of new technologies on mobile phones and even fix mistakes it has made in the past. He goes on to mention that new phones with new features, sensors, etc. are released all of the time and that new apps from Path can take advantage of these more easily than older, more legacy ridden apps. However, there is — as always — some caveats. Like Facebook, Path is completely removing messaging from its existing app. If you want to continue trading quick messages with people in your Path network–something that has driven much the service’s growth in recent times, according to Morin–then you’ll have no choice but to download the new Path Talk app. Some people won’t want to do that, and even if you do make the move, there’s no guarantee that all your online friends will move with you. To me this is the biggest risk. Why didn’t App.net work out? Wasn’t it’s Alpha service as good if not better than Twitter? That is certainly debatable. But what wasn’t debatable is that there were not enough people using Alpha day-to-day to make the service as valuable or interesting as Twitter is. Social services are made or broken by their users. If they don’t get millions of users they will not succeed. Camera apps aren’t so tied to popularity. Even a relatively healthy audience per app should be enough to make money on. For my own personal usage I think Path breaking out messaging and also this new “TalkTo” service they acquired makes complete sense. Because, while I thought Path was gorgeous, I found the limit on friendships to be too limiting for me to use the app regularly. By breaking these new apps out I can give Path a try again in a whole new way.